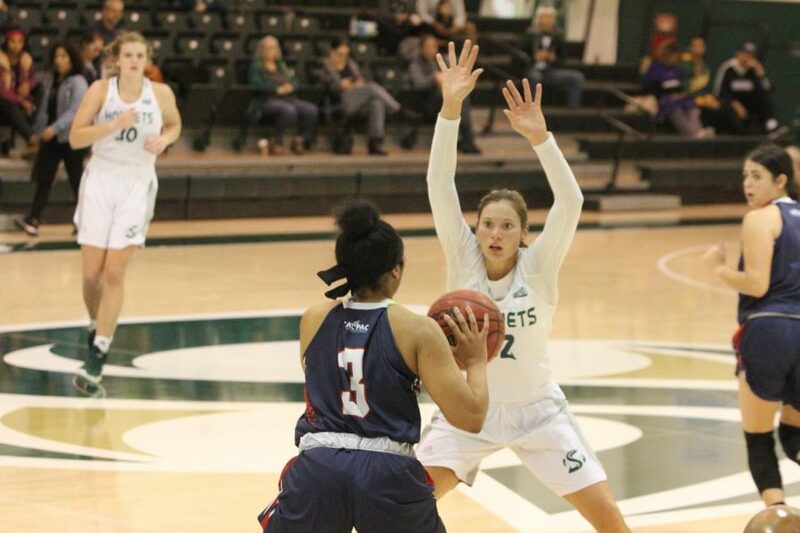 Sac State junior forward Hannah Friend guards an Antelope Valley player during the Hornets 86-80 win Saturday. 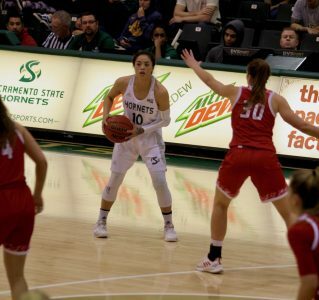 The Sacramento State women’s basketball team returned to the Nest Saturday for the first time in nearly three weeks to play against University of Antelope Valley. 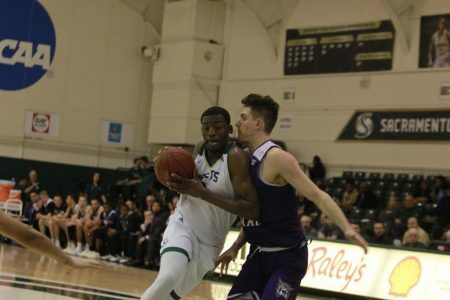 Sacramento State [3-1] got the narrow victory over the Pioneers [7-3] by a score of 86-80. 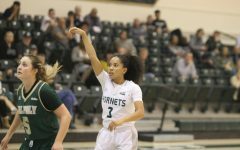 The Hornets were led to the win by two juniors, guard Hannah Friend and forward Kennedy Nicholas, who each had a double-double. 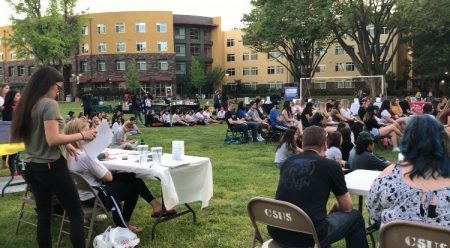 The team was scheduled to play Ohio State in a doubleheader with the men on Nov. 16, but both games were canceled due to poor air quality in Sacramento stemming from the Camp Fire in Butte County. 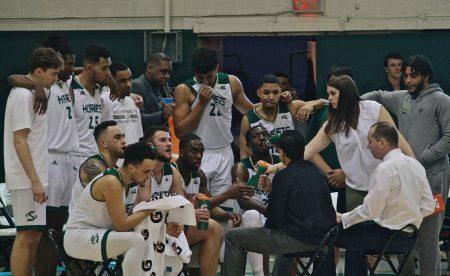 Sac State moved on from the cancelation to play in the ShareSLO Holiday Beach Classic in San Luis Obispo, California to play against Cal Poly, Pepperdine University and the University of Illinois. 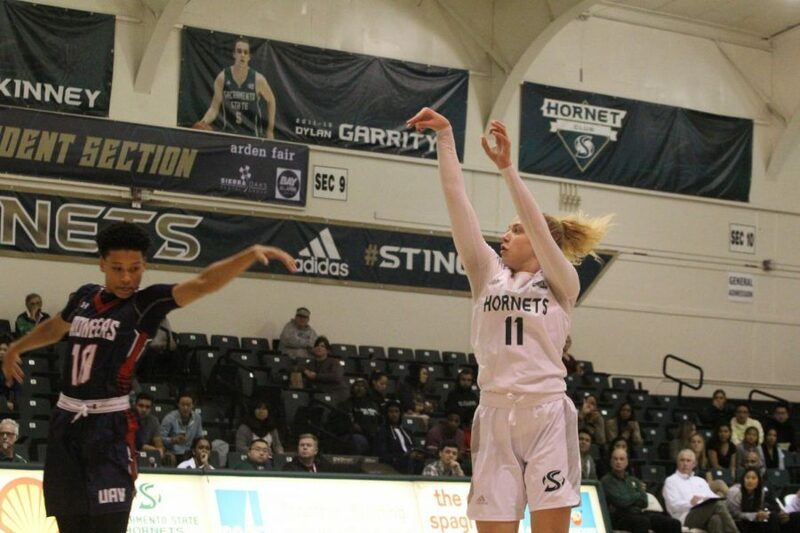 Sac State freshman guard Summer Menke shoots over an Antelope Valley player during the Hornets 86-80 win on Saturday. 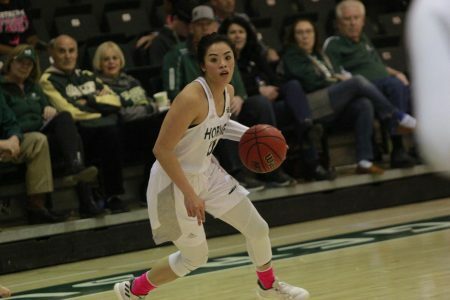 The women’s team played against Pepperdine Nov. 23 and took its first loss of the season 113-97. 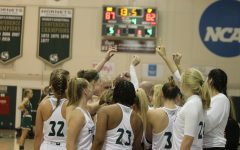 Friend and Nicholas each scored 20 points, followed closely by fellow junior guard Tiara Scott who put up 18 points. 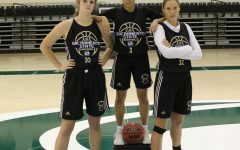 Despite this, the team’s “Big Three” could not lead Sac State to the win as Pepperdine senior forward Yasmine Robinson-Bacote set a new school record, scoring 47 points while adding 13 rebounds. 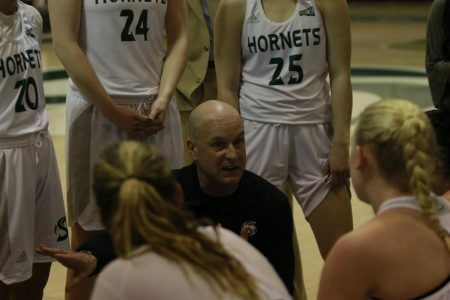 Following the big win against a Power five school, the Hornets found themselves leading the nation in several statistical categories after three games. 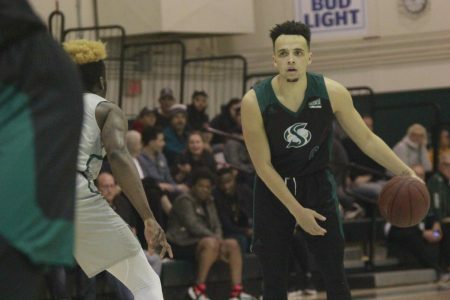 The Hornets and their uptempo offense, which the team has nicknamed “Bunky Ball,” was matched by the University of Antelope Valley on Saturday. Both teams sprinted up and down the court all game. Pioneers coach Deon Price matched Harkleroad’s substitution pattern subbing five players in, five players out every 90 seconds. 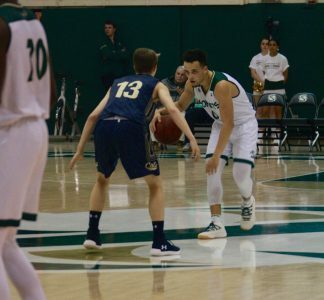 With the fast-pace play, mistakes were made causing turnovers, with the Hornets getting 20 and the Pioneers 16. 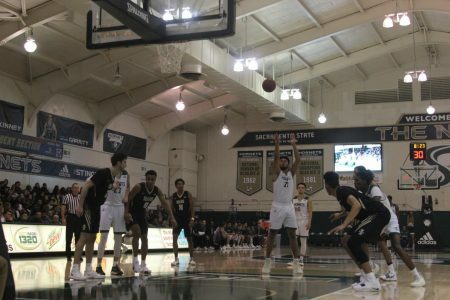 Sac State and the Pioneers played a back and forth game until it got to crunch time. The Hornets held UAV without a field goal in the final 5:24 of the game and closed the contest on a 9-0 run over the final 4:15 of the game. Friend and Nicholas led their team to the win, each with a double-double. Friend had 22 points, 15 rebounds and 6 blocks. 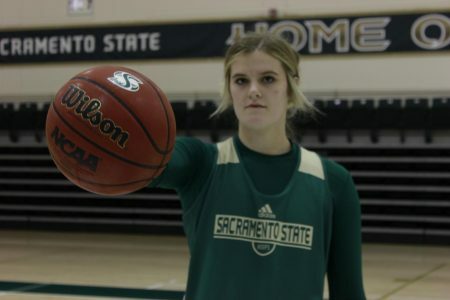 Nicholas had 19 points and 18 rebounds [7 offensive] to keep up her pace as the nation’s leading offensive rebounder. 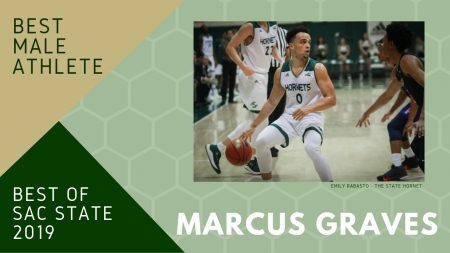 The Hornets play their next game on Wednesday at the Nest against the University of San Francisco at 7:05 p.m.